Venice Hotel Restaurant is a nice and cozy place for house guests and local people who enjoy great menu (40 items) and excellent service. A la carte options offer the best of European and traditional Russian cuisine. Food enthusiasts will appreciate the generous portions of fish, meat and other delights cooked to perfection. We offer a relaxed environment to enjoy wide selection of your favorite drinks, delicious food, wonderful music and what is the most important - warm and home-like atmosphere. The hearty food is presented by experienced Russian chefs and is served by dedicated team of waiters. We prepare unique menus for groups and special occasions. Our customers have choice of ordering service in a banquet room with karaoke. 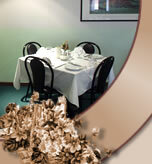 We thank our guests for observing our non-smoking policy in the restaurant. Strategically located in the airport area, our hotel is ideally suited for honeymooners who enjoy their wedding parties just before departure and provides exceptional flexibility for our guests. Served in the restaurant, this event is very romantic, beautiful and now fashionable among local people. All guests can enjoy photo session beside the hotel with a spectacular view of picturesque lawns and building architecture. Our wedding package includes menu of your choice, complimentary room and all those special decorations.